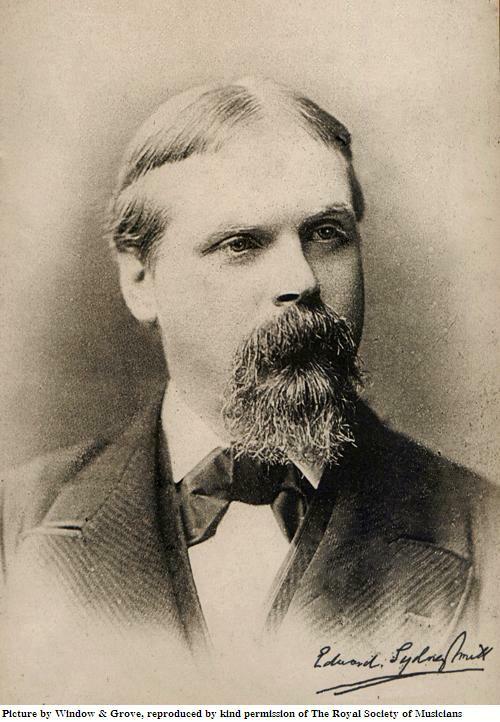 (Edward) Sydney Smith was born on 14th July 1839 in South Street, Dorchester. Smith was born within a year of Thomas Hardy’s birth in a nearby hamlet. Later, the young Hardy was apprenticed as an architect in South Street but no record survives of a friendship between the talented young men. Hardy paints a vivid picture of Dorchester and its inhabitants at this period under the name of Casterbridge in his famous novel. Frederick William Smith, Sydney’s father, a native of Deal in Kent, had settled in Dorset with his young bride, Helen (née Boyton) of Clifton, Bristol, the daughter of a professor of the pianoforte. He established a school of music and dancing at Dorchester and later in other local towns. The Dorset County Chronicle at this time records his return from Paris where he had gone to learn the Waltz! The first son, born in 1837, was given in addition to his father’s christian names, the name Boyton, his mother’s maiden name. He, like his young brother Sydney, received his first musical education from his parents and later studied music with S.S. Wesley, and at Hereford and Salisbury cathedrals. In later years he was the organist of St. Peter’s Church, Dorchester, and much of his published music is of a religious nature, and his compositions for the organ are, apparently, occasionally still used today. On his father’s death in 1870, Boyton took over the running of the school and ended his days in Dorchester in 1911. Notices in the local press in the 1840s report a series of concerts given by Mr. Frederick Smith (on violin), assisted by his sons Boyton (on piano) and Master Sydney (on ‘cello). Tickets could cost as much as ten shillings and sixpence (for a family ticket admitting four), the repertoire including Hummel and Spohr. There is no mention of a third son, Walter, born in 1840, but after training as a bookseller’s assistant, he died at the young age of 25. It is not known what circumstances led to the sixteen year old Sydney gaining a place at the prestigious Leipzig conservatory in 1855, but it is probable that, like Arthur Sullivan, he won a Mendelssohn scholarship and spent the next three years studying piano with Moscheles and Plaidy and ‘cello under Grutzmacher. Whilst there, he greatly impressed The Crown Prince of Prussia with his talent. 1858 saw his return to Dorchester where his talent was recognised by the eminent violinist, Henry Blagrove, who had once been in the employ of Queen Adelaide and was later associated with The Royal Academy of Music. On Blagrove’s advice, Sydney removed to London in 1859, taking up lodging in Upper Seymour Street, and quickly gained a reputation as a recitalist at the Crystal Palace and as a piano teacher in fashionable circles. His popularity grew rapidly over the next three decades, and his name became a household word. Indeed, so great was his celebrity that unlimited credit was extended to a preposterous man who impersonated him in Birmingham in 1872 until the deceit was finally uncovered! He became hugely famous in England, America, The Continent and Australia. His piano compositions were published in all these countries and sold well. Two or three times a year, assisted by his best pupils, he would give concerts in London and elsewhere, playing his latest pieces in addition to the virtuoso repertoire of the day. Especially popular were his elaborate transcriptions of favourite operas at which he excelled, and some of these are still popular today. His numerous solo piano compositions (including his famous “Tarantellas”) would be found in the old Victorian piano albums in many households. In the meantime, Sydney had married in 1867 Hannah Birch, the daughter of a druggist in George Street, W1. Originally from Amersham in Buckinghamshire, she was a graduate of a fashionable young ladies’ seminary in Marylebone. Records show her to be a singer in the choir of the Philharmonic Society, which was joined by Sydney at this time. Their first child, a daughter, was born in 1868 at 45 Blandford Square and was christened Blanch Edith. Sadly, she contracted rheumatic fever and died at the age of five; she was buried at Kensal Green Cemetery in the grave that is now the last resting place of both her mother and father. In 1870, the year of his father Frederick’s death, a son was born, Leonard Sydney, followed in 1872 by a daughter, Linda May. In 1873 another son, Grenville Boyton Sydney, was born, followed by Eustace in 1875 and the last child, Reginald, arrived in 1878. Hannah Smith’s health broke down as the 1880s progressed and finally, in 1886 she died of Bright’s disease at 56 Great Coram Street where the family had moved that year. She was buried on 16th July 1886. Her death was registered by a young French woman, Blanche Augustine Pinget, who had nursed her in her final days. This young woman aged 25, had been nurse to the Smiths’ children in former years and she was to become Sydney Smith’s second wife on 28th October 1887 at St. John’s Parish Church, Hampstead. Little else is known of this young woman other than she was the daughter of Joseph Pinget, deceased, and after her marriage she resided with Smith at 28 Birchington Road, Kilburn. At this time Sydney was already suffering from a ‘severe malignant tumour of the spine and ribs’ which had forced him to relinquish his teaching and concert career — with the consequent adverse effect on his income which had hitherto been, it seems, ample. Despite the huge popularity of his music, nearly 400 compositions in all — an average of 10 or 11 per year, there can have been no royalties to fall back on and Sydney was driven to borrow £160 on a life insurance policy of £1000. As the illness progressed inexorably to its grim conclusion, financial hardship must have added to the tragedy. Eventually, The Royal Society of Musicians (which Smith had joined in 1875) was applied to for assistance and — having ascertained that he had less than £20 left in the bank — they granted some relief. The spring of 1889 was a particularly bitter one and on a ‘villainous day, 'twixt frost and thaw’ — March 3rd, the celebrated composer died, and four days later, he was laid to rest at Kensal Green Cemetery: a simple uninscribed cross now marks the overgrown grave. A brief obituary in ‘The Musical Times’ reflects the change that had taken place in musical taste by this time, and its dismissive tone paved the way for most subsequent comment on Sydney Smith and his music. The evocative titles of Sydney Smith’s pieces paint a vivid picture of middle class Victorian music making at its most robust, and although he was very clever at supplying a public need, the much repeated criticism of this style — summed up in the basic formula ‘maximum effect with minimum difficulty’ does not bear scrutiny. It should be argued in Smith’s favour that he had the gift of achieving his effects by the most musically economic means. Unlike many popular Victorian composers whose style is marred by a plethora of superfluous notes disguising a slight content, Smith rarely permits himself this indulgence in his well-crafted pieces. These compositions may not aspire to the rank of the highest sophistication, but to follow the established fashion of dismissing Sydney Smith’s entire output as musical trivia is surely to miss the point. Here we have a composer whose melodies still have the power to delight and amuse, and his best creations certainly deserve a fresh appraisal. This can only come about if the manuscripts are collated and preserved, indeed, even rescued from oblivion. This, together with the promotion of the music of Sydney Smith and his contemporaries, is the aim of The Sydney Smith Archive.